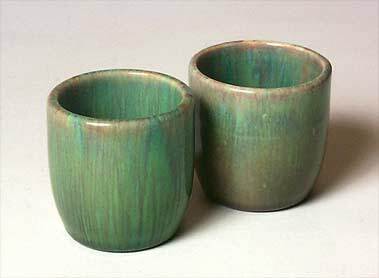 Devonmoor eggcups - 2" (50 mm) high. We do not have much information about Devonmoor. It was established in Newton Abbot, Devon in 1913, but ran for only about a year. Perhaps the proprietors were called for service in the first World War. The company re-opened in 1922 by Herford Hope. The pottery remained in operation for about six decades.